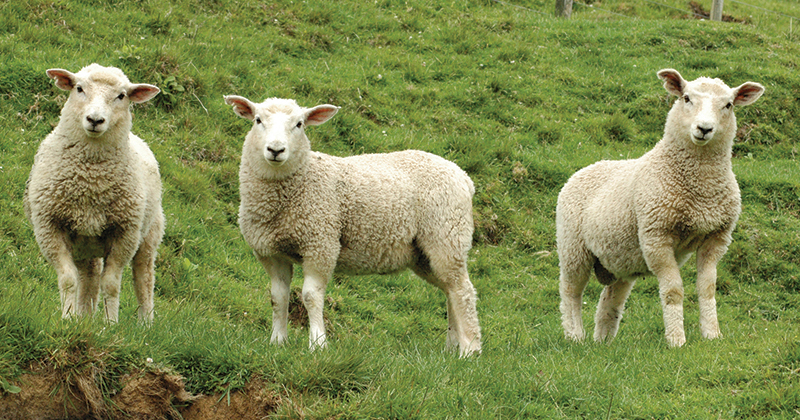 The three-week recess seemed to create pent up demand from the processors, with the larger offering and stronger A$ unable to dampen competition – the wool market had a good week. AWEX reported that buyers were bidding strongly from the outset to fill orders secured over the break. As Mecardo reported in the last sale report prior to the market recess, demand is good and with growers seemingly selling as soon as wool hits the stores any improving demand will construe to create increased competition on the auction floor. This theme certainly continued this week. 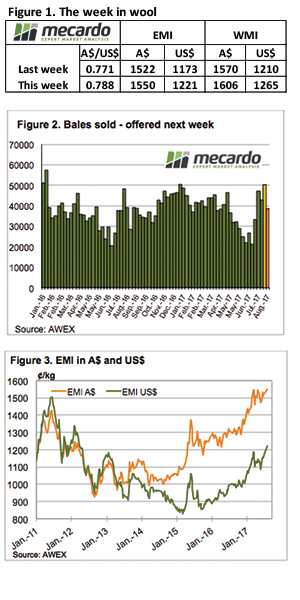 The EMI rallied A$0.28, the WMI improved A$0.36 while in US$ terms the EMI increase of US$0.48 was significant. While all MPG’s improved, it was the 19.5 MPG and broader that performed strongest including X Bred types. The 28 MPG is back above 800 cents for the first time in 12 months while it was September last year when the 30 MPG closed above the current 614 cents. This strong auction market translated into strong bidding on the Wool Forward market with growers stepping in to secure good forward cover for the remainder of 2017, and trades secured into 2018. With a larger offering (on top of a big offering pre-recess) and a season low pass-in rate of 3.9% (season average 6.3%), 50,300 bales were cleared to the trade. This is an outstanding result compared to recent sales patterns; the last time 50k bales were sold was in December 2016, and then you need to go back to January 2016 to see more than this number sold. There was one negative in the market; the cardings indicators in all centres retreated against the general market trend to post. A small offering in Fremantle held the market steady, however in Sydney & Melbourne the Carding indicator lost 40 & 23 cents respectively. The result this week gives confidence for the week ahead, and with the A$ seemingly having peaked we should see another strong result with all centres selling. The smaller offering is a portent of things to come with less than 40k bales rostered per week over the next three weeks; this should assist the market to at least retain current levels.